Posted in Fish, Salads, on February 11th, 2008. You can’t see the toasted couscous on the bottom, but it’s there, topped with watercress, then lightly breaded shrimp, and drizzled with a delicious orange mayo sauce. Another recipe from the “stack” I sorted through the other day. And this one is an absolute over-the-top winner. Ordinarily I might have passed by this recipe. We don’t eat couscous, generally, because it’s a high glycemic carb. Couscous is actually little tiny orbs of pasta, and takes no more than adding water (hot) to it and it’s cooked and ready. But, this recipe won a cooking contest at Cooking Light in 2006. (I know, I told you, I’ve been behind in filing my recipes :-), and the rest of the recipe sounded so delish that I held onto it. DH and I went to a local farmer’s market and had bought some fresh shrimp with no plan as to what I’d make with it. Here’s the crux of the recipe: you make a mayonnaise-based cold sauce with reduced orange juice, lime juice, cilantro, ginger and cumin. Then you toast the dry couscous in a large pan. THAT I’d never done before, but it added a wonderful taste to the simple prep of couscous. You add chicken broth and orange juice to plump up the couscous, then green onions and almonds at the last. The shrimp: rolled in egg white, then tossed around in a plastic bag with panko, cilantro, fresh ginger and some pepper. You quickly saute the shrimp, then start the artful arrangement: couscous on the bottom, a nice mound of fresh watercress, the hot shrimp, then you drizzle the whole thing with the sauce. First photo, the couscous toasting golden brown in the pan. The mayo sauce (small amount, really) based orange ginger sauce that’s drizzled over the top and becomes a kind of salad dressing. Lastly, the crunchy shrimp moments before serving. They’re crusted with panko, cilantro, fresh ginger and ground black pepper. The history of the recipe: Cooking Light – the Ultimate Reader Recipe Contest, 2006. There were several categories, but the judges were all, hands down, in love with this dish, which won first prize. The cook: Karen Tedesco of Webster Groves, Maryland. Notes: I think next time I’d make a little more of the sauce – it was barely enough (because it’s so darned good). Watch the couscous when you’re toasting – it goes from normal to toasted in a matter of about 30-40 seconds. I’d chop up the watercress just a little bit. I’m kind of haphazard when I wrench off most of the stems, but even medium stems are hard to eat. This is a one-dish meal – you need nothing else with it. No salad. No side. It takes about 30-40 minutes from start to finish. Would make a lovely company meal. 1. To prepare sauce, bring 1 cup orange juice to a boil in a small saucepan over medium-high heat; cook until reduced to 1/4 cup (about 10 minutes). Remove from heat; cool completely. Stir in 1 tablespoon cilantro and next 7 ingredients (through red pepper); set aside. 2. To prepare couscous, place couscous in a large nonstick skillet over medium-high heat; cook 3 minutes or until toasted, stirring constantly. Remove from heat and add 1 1/2 cups broth, 1/2 cup orange juice, and 1/2 teaspoon salt; bring to a boil. Cover and let stand 5 minutes. Fluff with a fork; add onions, almonds, and butter, stirring until butter melts. Keep warm. If made an hour ahead, briefly reheat in same pan until it’s hot all the way through. 3. To prepare shrimp, combine shrimp and egg white in a bowl, tossing to coat. Combine panko, 1 teaspoon cilantro, 1/2 teaspoon ginger, and black pepper in a large zip-top plastic bag. Add shrimp to bag; seal and shake to coat. 4. Heat oil in a large nonstick skillet over medium-high heat; arrange shrimp in a single layer in pan. Cook 2 minutes on each side or until done. 5. 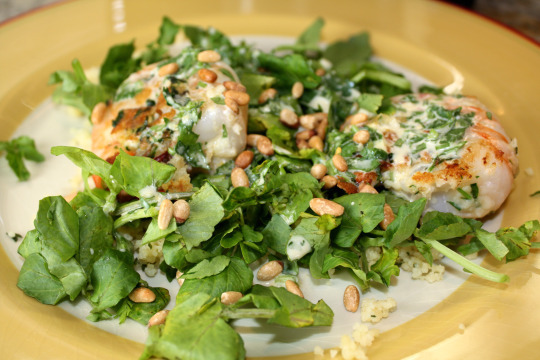 Divide couscous evenly among 4 plates; top evenly with watercress and shrimp; drizzle sauce over shrimp. Per Serving: 423 Calories; 17g Fat (34.3% calories from fat); 21g Protein; 52g Carbohydrate; 4g Dietary Fiber; 63mg Cholesterol; 557mg Sodium. What an interesting recipe. I’ve heard about dry frying pasta before boiling it but couldn’t quite see the point. You have made it clear to me. The flavourings in this dish are some of my favourites, especially the cilantro; or coriander as we call it over here. I’m glad to have found your blog – this is my recipe! It’s so fun to see that you enjoyed making it – this is one that I actually make a lot for company, too. And I agree; the amount of sauce is too small AND I usually add a little more oil to the pan when cooking the shrimp. In order for this to be a “light” recipe, the fat portions are strictly portioned – you know how that goes. “Favorites Lists”. It surely belongs there !! I will make this again and again and again. dinner. All the gals left with a copy this recipe. The general consensus was “This is what I would expect from a fine dining restaurant”. Thank you!